1st reason:The buildings are a focus for vandalism and ‘goings on’ and are in a state of disrepair. Speaking with former members of ‘friends of Hopwas Woods’ who know a lot more history about the site than me, they have given me some interesting information about its history of vandalism and abandonment, with Bob Geldoff and badgers included! The source is reliable as the person is a lifelong supporter of Hopwas Woods, I’ve received the news second hand and a lot of the information is cloudy and I take all responsibility for the information given but it does gives the general gist. The entrepeneur George Bryant sold the property to Tarmac at a date interdetermined date probably 80’s/90’s. It was then used by an employee of Tarmac for a time, after which time it was abandoned although still under the ownership of Tarmac. 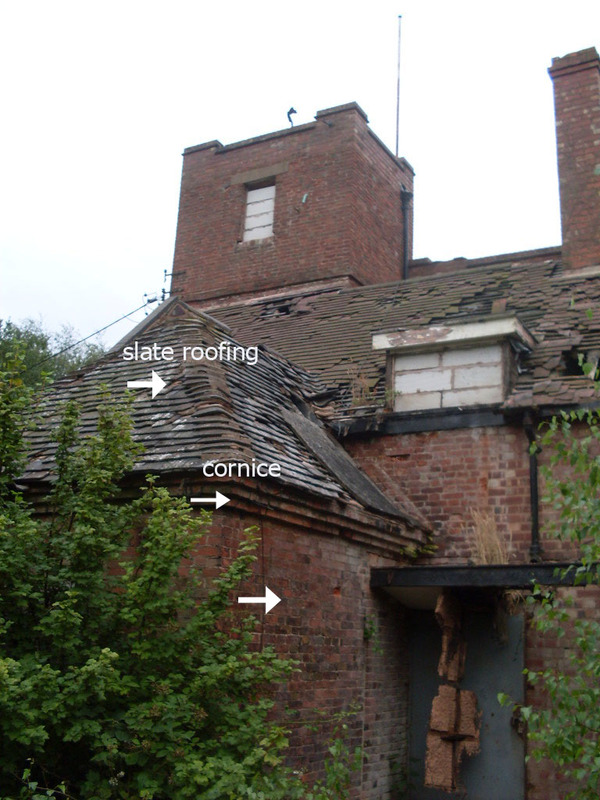 The buildings were brought to local attention by the report by a local person that badgers had entered and were in the cellars of building. This reached the attention of Tamworth’s newspaper, The Tamworth Herald. After this brief media exposure the buildings were more known in the area and people entered the grounds(abandoned atmospheric buildings in atmospheric woods:it’s going to happen!) This came to a head when news reached local authorities that a ´suspicious person´ was staying there, and there was a response by police. 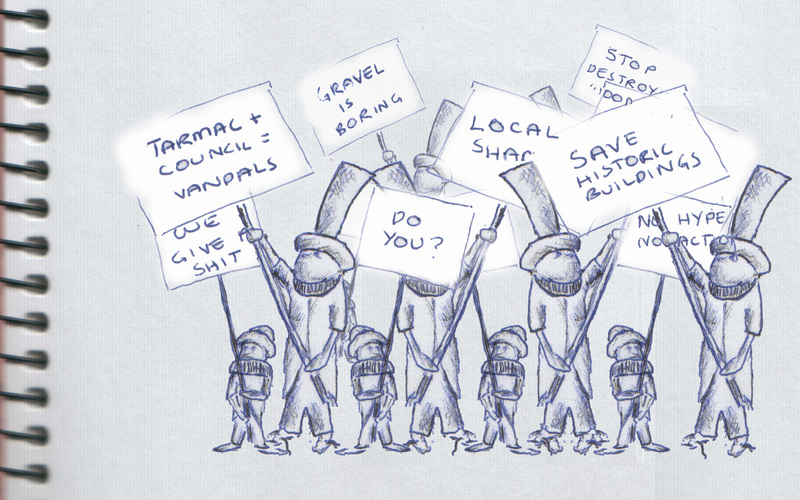 Since then people from around the country have visited the site and it has appeared on some exploration forums. Apparently, this is crazy but I’m just reporting what I was told by a reliable source, Bob Geldoff, sorry Sir Bob Geldoff visited the site!!! I know crazy. Looking at the current state of the exterior buildings it has suffered from vandalism, ( hole put through back wall) and equally damaging counter measures, bricking up of windows and doors. Apart from that the building survives surprisingly well in its integrity(the interior state is unknown) and has not had any graffiti or major damage. The outbuildings present little interference. 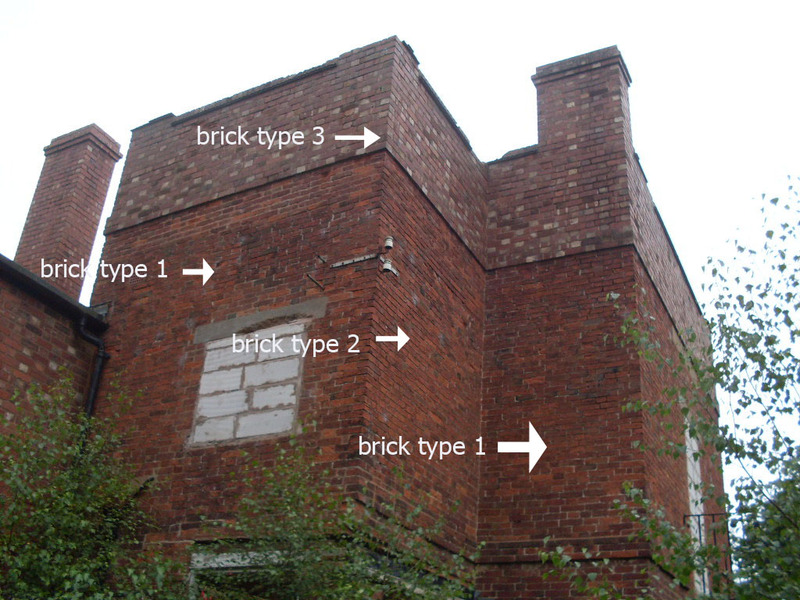 2nd reason: The buildings have been altered, there is a lot of modern brickwork and they are of not sufficient interest. 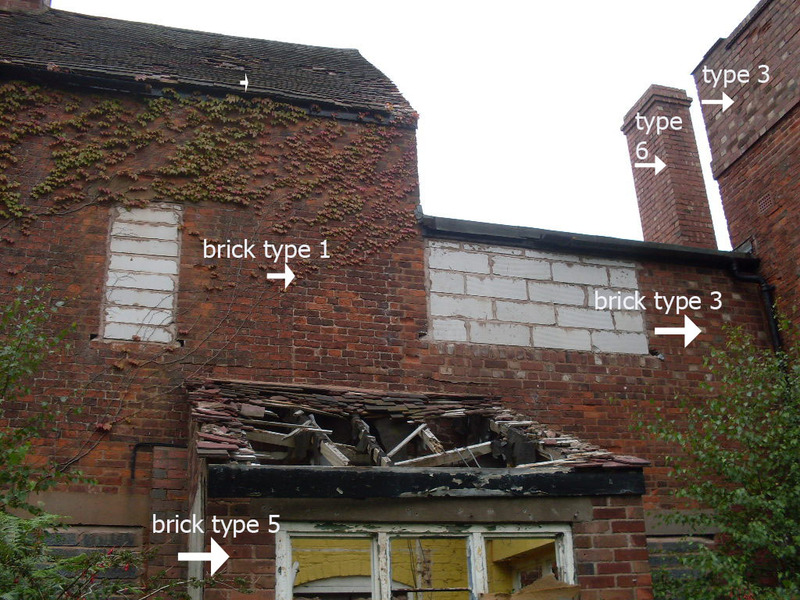 Although I’ve worked within archaeology abroad I’m no expert on 18th century architecture and brickwork in Staffordshire but I think I can make a sufficient case for it to be worthy of at least re-examining by the competent authorities. The sources available are sparse but based on what there is and local knowledge as well as my own analysis I can make a number of statements. As mentioned in previous post, the buildings were probably built on orders of the Marquess of Donegal around 1750 for use as a hunting lodge and retreat, being close to his Fisherwick estate. Local hearsay reports that there was a site here as far back as 1540, from the wife of the earl of Comberford, I cannot confirm any of this but its worth investigating. Also Fisherwick estate and buildings were designed by the infamous ‘Capability Brown’ As the woodhouse was commissioned by the Marquess of Donegal, did Capability Brown have a hand in its design? It’s pure conjecture but I think it’s more than worth investigating. 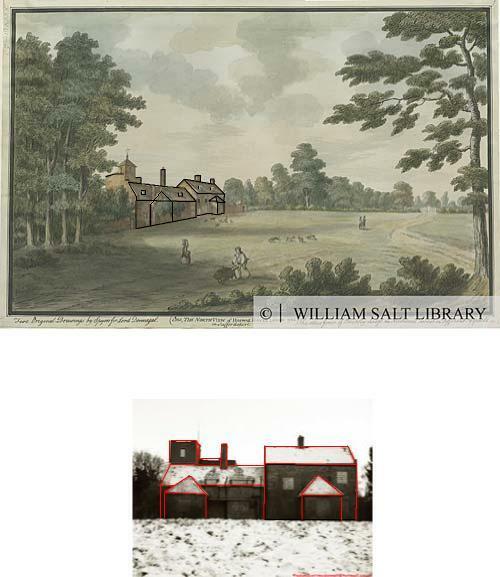 There is a watercolour of the woodhouse, called painting of Hopwas Hayes Lodge, done by J. Spyers in 1786. I’ve compared the painting and a modern photo in the previous Woodhouse post and its undeniably very similar (I´ve included it again below). At least the integrity of the building set are still there. The two attached cottages, the two porches and unique tower structure are all still there, as well as side wall, with entrance(not in photos) It can be seen that the main roofing has been altered and there’s been tinkering with the tower. I haven’t personally seen a building type quite like it and wonder if it conforms to a type of 18th century hunting lodge or is it unique? There is not much available information on subsequent use of the Woodhouse, apart from what I have in my original post. The building was used throughout the 19th century as a gamekeepers lodge and was remarkable enough to be included in William Pitt’s topographical history of Staffordshire 1817 with the following description:´ Hopwas is a small hamlet situated at the bottom of a hill, the most remarkable object on which is a house on the summit, environed by a wood called Hopwas Hayes´ Thankyou William Pitt for putting the case for the Woodhouse so eloquently! As mentioned the building was in the hands of George Bryant from around the 1950’s. 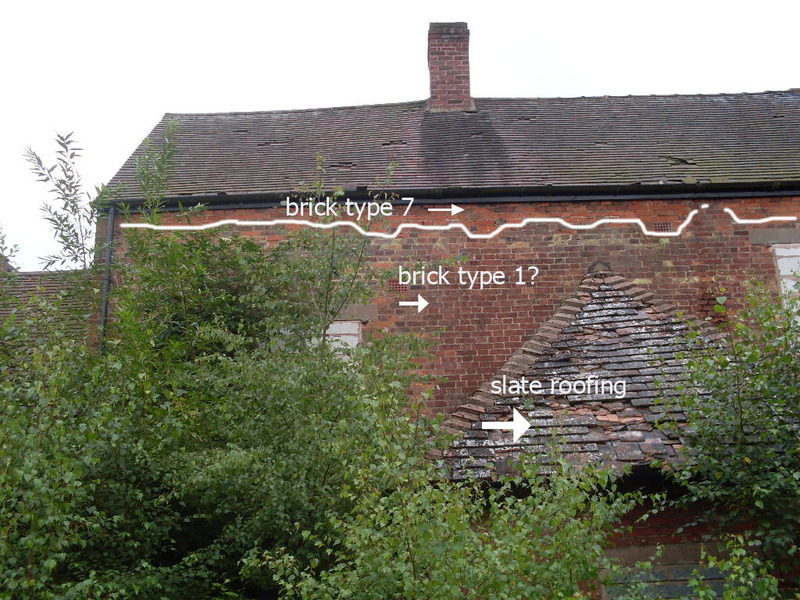 He apparently was responsible for some landscaping and may have been responsible for alterations to the property as there is brickwork present from the 1950’s. There is aforementioned watercolouring showing the integrity of the original form of the present building but the question is how much is original? 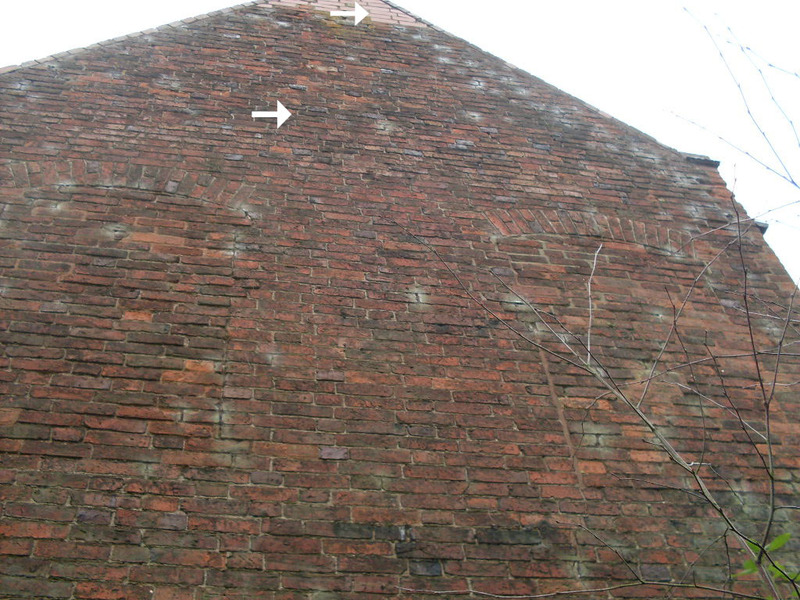 As said before I’m no expert but there is a presence of brickwork which I consider could perfectly be 18th century brickwork, the percentage is at least 50% The roof has been changed at what date I don’t know and the tower, at least the top part has been altered. Are any of the alterations reversible? 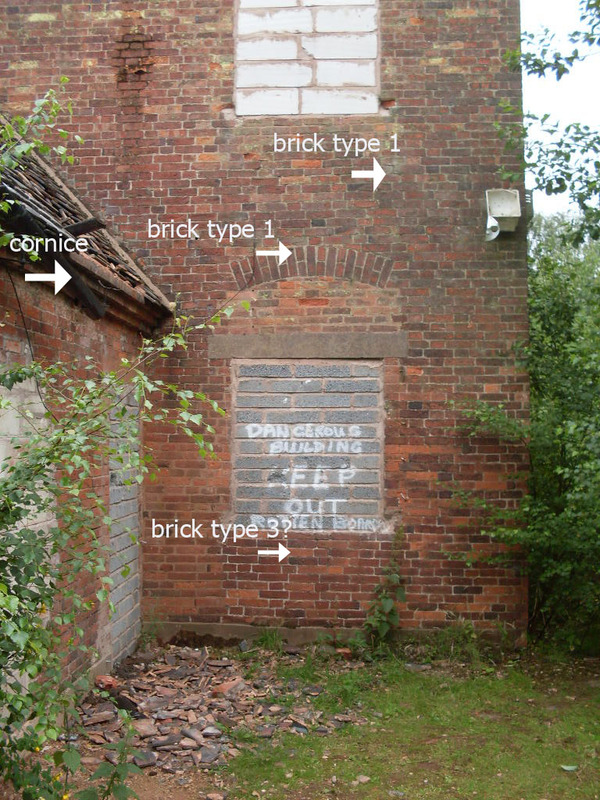 The best evidence are photos so I’ve provided a few photos below with arrows pointing out what I consider different types of brickwork. 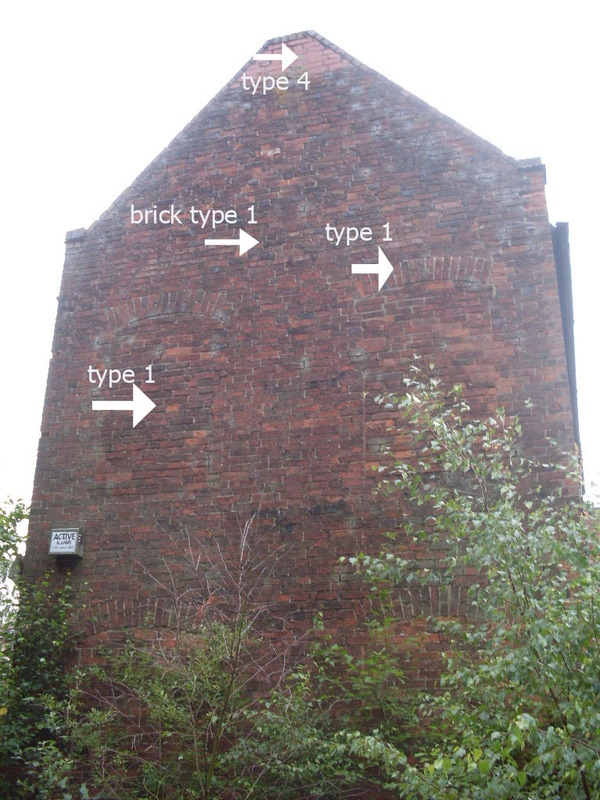 brick type 1 looks the best candidate for 18th century brickwork. The porches on the front of the building appear to have slate roofing. 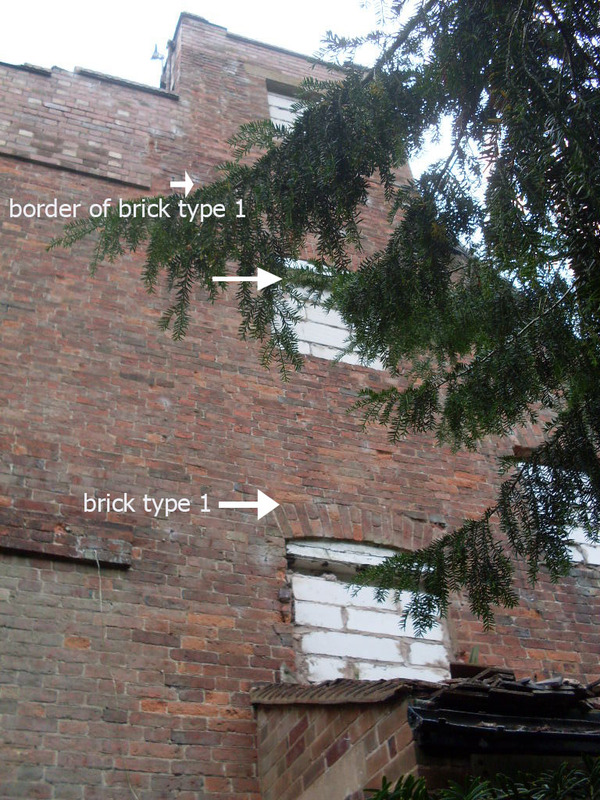 Also there is number of blocked 18th/19th century windows, but the window arches(sorry about terminology) are still there( altering of windows is very common in old buildings) It´s a rough guide and hopefully not too confusing but I believe demonstrates that there is at least 50% possible 18th century brickwork(brick type 1) and is worthy of further investigation. The interior is an unknown quantity and understand that there has been no inspection of the interior. Information from the reliable source from Friends of Hopwas apparently states that there is a well inside! 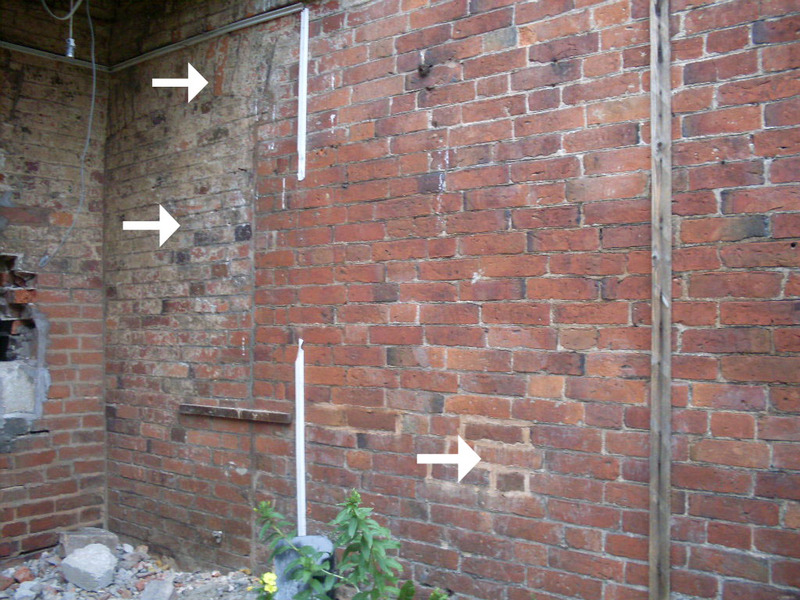 (common in buildings before modern water supply), the survival of a double cellar, fireplace and wooden cladding.I think anyone would agree that the interior warrants inspection. Well there are my counterarguments, I hope I’ve put across the historical and architectural value of the place and a valid counter counter argument to the often used reason of abandonment and vandalism. What has to be concluded by the experts is the level of altering to the exterior and INTERIOR of buildings and if it´s reversible. So I will be putting the case forward to the relevant authorities and english heritage. What I don’t think can be denied is that it’s worthy of further investigation before potentially making the tragic mistake of demolishing it. I hope it’s not too late!